Have you ever missed an important email because countless calendar invitations engulfed it? Creating a Gmail filter for Google calendar responses can sort that out… literally! Whether you get a lot of invites to events or not many at all, the last thing you want is to have no idea that said invite is actually there. Although Gmail doesn’t have a direct way to separate calendar responses from other email messages, there is a workaround. 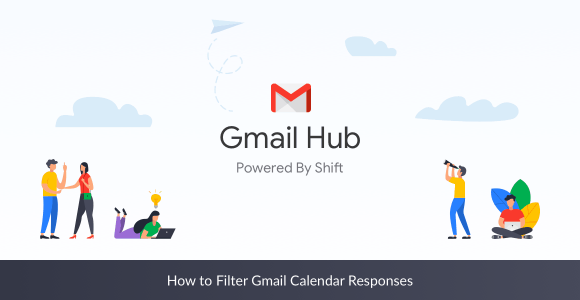 Setting up a Gmail filter for your Calendar invitations—especially if you have multiple of your Google Calendars synced up—will save you from having to search through your inbox tirelessly. You know if and when you’ve opened an invite in the middle of the night and then lost it? Never again! Here’s a quick way to automatically filter Calendar invitations into a folder of their very own. Note: It’s optional, but if you want to keep a clear inbox, you can also check “Skip the Inbox” to archive the responses. You can also always still view them if you need to. Oh, and did we mention that you can do this with each multiple Gmail addresses with a few clicks in Shift? Simply repeat the above steps with each of the Gmail accounts you would like to have the filters on. Is there anything Gmail filters can’t do for you? I mean, besides making you breakfast. Also, if you need to brush up on how to create Gmail filters, check our guide here!